I’m really happy that Friday is finally here! But I’m wondering, when oh when will Spring arrive??? At Home On The Bay. Hello everyone and thank you to Suzy for inviting me to join House Snooping this week. My name is Mary and I blog at At Home on the Bay. I blog about budget friendly DIY home decor, crafts, thrifting, baking and all things that inspire me. Our house is located on Blue Hill Bay in Maine, and the view of the bay is definitely it’s best feature. Welcome to our home. 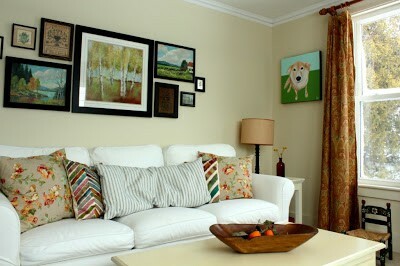 I would say my style is vintage, country, cottage eclectic. Is that even a style? Come on in. You can hang up your coat on the shutter from my husband’s childhood family cottage that we turned into a coat rack by adding some Restoration Hardware knobs. My collection of Paint by Numbers started when I spotted two at a local antique barn for only $12 each. I wish I had all the ones I did as a kid. Please have a seat in the living room and make yourself comfortable. Don’t worry about the white sofa. It has a washable Ikea slip cover on it. I don’t know how they can sell them for $50 and make a profit. Seriously. I learned how to make a professional looking pillow by adding a zipper and found out it was much easier than I thought. I like making all kinds of pillows. They are an inexpensive way to update a room. You can find my pillow tutorials here. The dining room is just off the living room, and it was one of the first rooms I worked on. It started when I painted a built in cupboard with Annie Sloan Antibes Green chalk paint. I’ve also been adding to the plate gallery as I find or make new plates. One of my most popular DIY tutorials is the Ikea hack barn light I made for over the kitchen sink. It is a $15 Foto pendant that I spray painted. My most recent update was our back hall. It really feels bright and welcoming now. Finally, my favorite room is our master bedroom. It is a relaxing place to end the day. Our house is an on going DIY project. If you’d like to see more, please stop by At Home on the Bay. I’d love to meet you. Thank you Suzy. I had so much fun sharing our home today. Thank you for showing us around your lovely home, Mary. I so enjoyed the tour and all of your diy projects. You have such a wonderful vision! Beautiful home…so filled with many creative items…I love every room and the views are gorgeous!…and love the shutter turned coat rack and hanger….Thanks for the great feature today Suzy!!! Wow, this looks like a warm, fun home. I especially like the ‘Sunshine’ board above your sink. Thanks so much for the tour of your home. I’m suddenly craving a New England seafood sandwich. I love Mary’s home and could just pack my bags and move right in. love mary and her home- so relaxed yet stylish at the same time! Your home has an amazing view — beautiful! I love how you decorated with the plates on the wall in the dining room. What a spectacular view and beautiful home. I know I say this a lot but, I so look forward to Friday snooping. Suzy, thanks again for inviting me to join your House Snooping series. Everyone comments are so sweet! Thank you. I love Mary’s home and style. 🙂 Great feature! Beautiful and warm home. I see lots of love here. Awesome view. I wouldn’t get anything done because i would be looking at the view. I just love your home and blog, Mary!